Should your kid be allowed to use Snapchat? Use this parents guide to Snapchat to make the best decision for your family. This guide to Snapchat will answer all your questions about how Snapchat works, how to use it, and most importantly—how your kids are using it. Most parents have heard of it, usually because it is at the top of the list of apps you should never let your children have. But most parents also have no real idea how Snapchat works, nor do they understand why their kids love it so much. 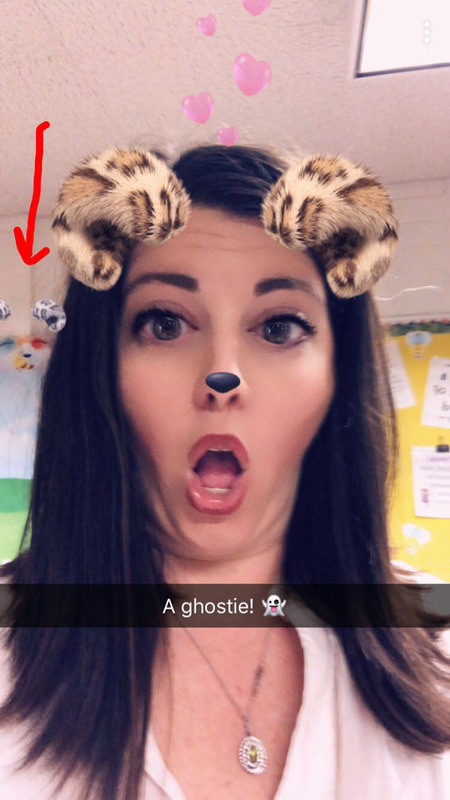 When I learned just how much my kids use Snapchat, I decided to finally figure out how to use it and see what all the hoopla was about. And before you wonder why I let them have it in the first place, I'll tell you. I would rather have my children learn to use social media under my watch instead of banning it and having them either use it without my knowledge (my kids have friends whose parents do not allow the app, yet they somehow have it anyway) or get it when they leave my home and not know how to use it responsibly. I would much rather have them using it with my full knowledge, sharing their passwords with me (which I require), and discussing it with me regularly. And that is why I have learned all I can about Snapchat in the past few months. I've actually had Snapchat for several years now—when my eldest daughter was a freshman she told me I should get it so we could snapchat together (she is graduating from high school next month!). And I never could figure it out, so I didn't use it much. The interface was not intuitive for me at all! I watched my daughters swipe and snap and type and filter with total ease and I was completely lost. Now, I am a Snapchat expert...kind of. I'm still not as fast as my kids, and my SnapScore is pathetically low, but I do finally understand the ins and outs and I am armed with the knowledge I need to help my kids navigate it safely. More importantly, I know how to see what my kids have been up to in Snapchat when I log in to their accounts (because I require passwords, remember?). Oh—and that whole thing about it being one of the worst apps to let your kids have? I don't agree. Like any social media, Snapchat has its concerns and can be misused, but I think parents are mostly afraid of what they don't understand. 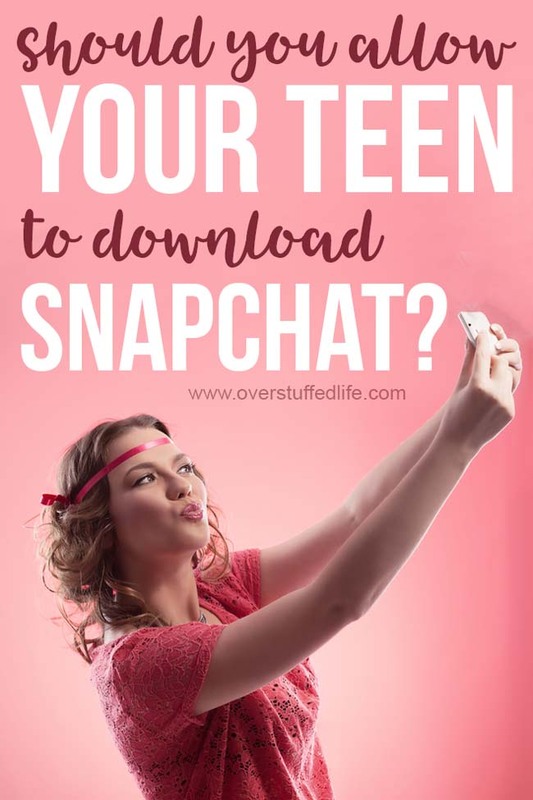 I believe that if you really delve into Snapchat and see what your kids are actually doing in the app, you wouldn't worry quite so much. 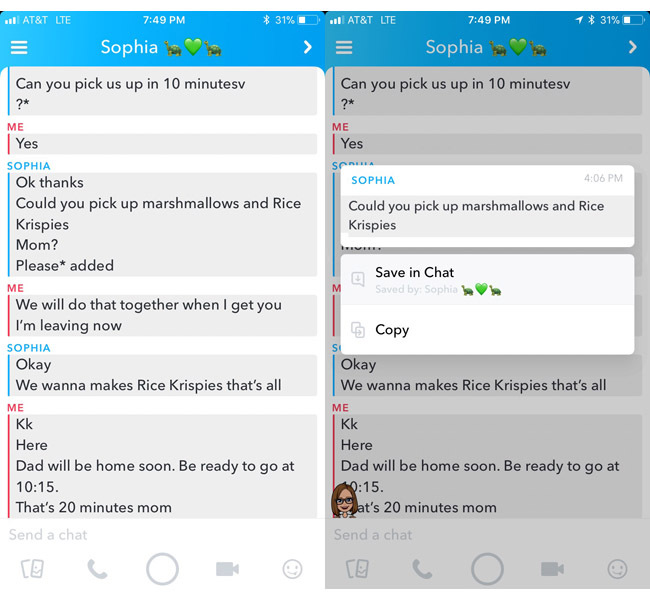 Snaps are disappearing photos or videos sent back and forth and are perhaps the most concerning part of Snapchat for parents. A snap can only be viewed twice before it disappears forever. To us parents, that is hard to swallow because....what are our kids sending back and forth to each other? And while kids definitely do things like sext, bully others, and send nudes over Snapchat, that is most likely not what they are doing. My kids use this feature most to send silly selfies to each other. Almost to the point of annoying the heck out of me when some friends send a selfie a second, but mostly it's just one or two a day. The Snaps can be doctored with filters and emojis and text and pictures and all sorts of things, so it's really fun for the kids to be creative with their snaps, too. Depending on the friend, they also do a lot of communicating via overlaid text on these snaps. While this can be a way of hiding conversations from parents—I find that I can usually ask what's up and get a straight answer from my kids because we've developed that sort of relationship. And they know that if they are too secretive about what is going on, they will lose the privilege of using Snapchat. But mostly it's all just fun, even if it sometimes feels like a waste of time to us parents. 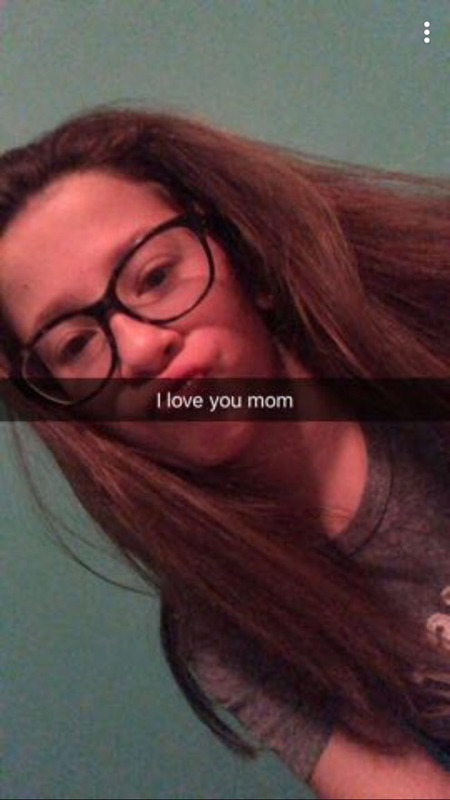 And who can be upset when your kid snaps you that they love you? Not me! One of the reasons kids love this form of communication so much is because it disappears. This is not because they are sending things they shouldn't—it's because it makes it more like hanging out. Our kids have grown up in a world where every little thing they do is documented and they spend hours obsessing about having the perfect Instagram feeds (which has actually led to them having fake Instagram feeds they don't have to obsess about quite so much) and making sure that all those saved and well documented parts of their lives are perfect. 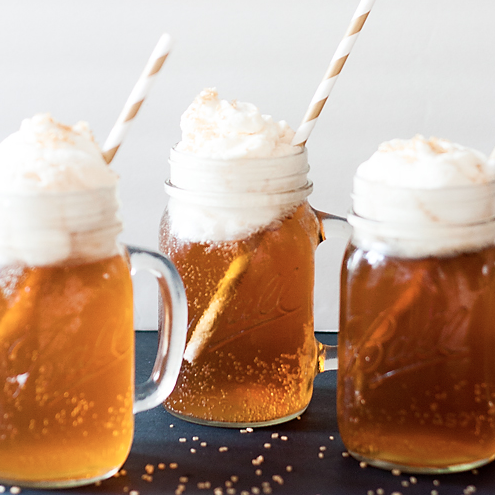 Well, they don't have to be perfect on Snapchat. And they really like that they don't have that pressure. To send a snap, go to the snap screen and take a photo by pressing the large circle. You can take a video by holding the circle down. Chats are basically text messages, except—you guessed it—they disappear. However, Snapchat users have the option to save chats if they want to so they won't disappear. If either end of the conversation saves a chat, it is saved for both users. My youngest daughter pretty much automatically saves every single chat she sends and receives via Snapchat, which helps me to see what she's been up to. Because I can generally see all the chats, a few serious discussions have taken place at our house about what is acceptable and what isn't acceptable to do and say over text messaging or social media. Mostly minor middle school drama sort of stuff, which still warrants big discussions anyway before it gets completely out of control. You can tell if a chat has been saved because it is highlighted in grey. To save or unsave, you simply touch the line of text and it will save/unsave it. You can also hold down your finger on the line of text and see who has seen it, who has saved it, and what time it was sent. You can also see what time chats were sent by swiping right on the chat screen. You can see if the other person is looking at the chat screen because their bitmoji avatar will pop up. See how Sophia popped in when I was taking the second screenshot in the photos above? Probably because she got a notification that I took a screenshot (more on that later). As far as I can tell, Snapchat is almost the ONLY way my middle school daughter and her friends communicate. That is one reason I hesitate to take it away from her—I want her to be communicating with her friends. Learning to communicate with peers is an important skill to learn, and right now texting and social media is the way they do it. If they never actually got together in real life I might worry more, but she is part of a pretty social group who are also always hanging out and doing things together, too, so I know they are also learning in person communication skills. Stories which last 24 hours are beginning to be more popular on other Social Media apps like Facebook and Instagram now, so you are probably more familiar with them. 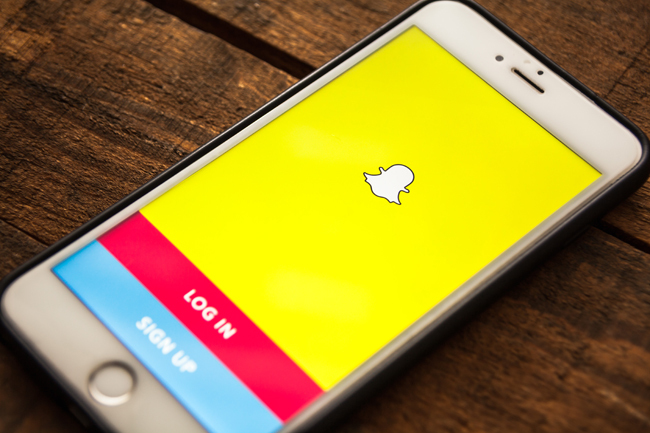 On Snapchat, kids can post photos and videos to their story and their friends can see the story for 24 hours before it will automatically disappear from the profile. It is interesting to see what kids choose to post—some are very prolific and always have lots of videos, selfies, and memes posted on their stories, while others only post important events or photos of their friends when they are hanging out together. If you want to comment on or reply somehow to someone's story, you can slide up and type something and it will be sent to them via a chat with their story attached. The middle school set especially uses stories as a way to spread viral memes which can sometimes be concerning for parents. Things like "Send me an emoji for a TBH (to be honest)" or "Post this on your story if you think I'm ugly" can set people up to bully others and bring quite a bit of drama. Sometimes they are just fun things, but it's something that you'll want to keep an eye on as it's a good time to discuss why some of these memes are not wise to share. 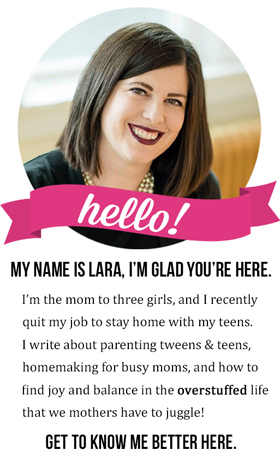 Sara.hah is another app that sometimes kids attach to their stories for people to tell anonymous secrets. I do not allow my kids to use that particular app because it is too anonymous and I have seen some things on Sarahah via Snapchat that are concerning. There is already plenty to do on Snapchat without adding yet another layer. With the latest SnapChat update, you can see stories directly on the messaging tab. 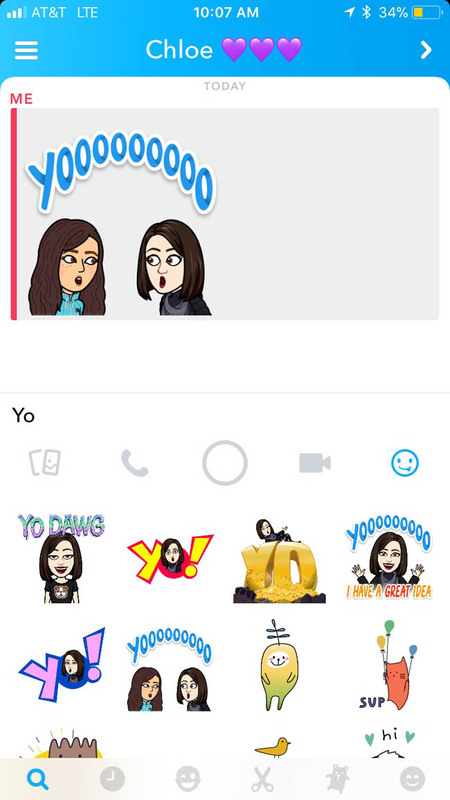 When someone posts a new story, their Bitmoji avatar will show a thumbnail of the story instead. You can see below how my daughter Sophia has posted a new story, while everyone else on my list shows the avatar. Once you have watched the story it will go back to the avatar on that main page, but you can still see the story thumbnail on the person's profile and on the SnapMap if you click on them there. Stories can be watched multiple times in the 24 hour period they stay up. You can swipe up on your own stories to see who has viewed them, and whether or not they have been screen shotted by anyone. If you are looking at Snapchat, you can pinch the screen and the SnapMap will pop up. Any of your friends who are sharing their location with you will show up on the map. This means your kids can see where their friends were the last time they opened Snapchat. You can touch anyone on the map and see exactly when they were last on the app, too. If they have a story currently up it will also show that on the SnapMap. 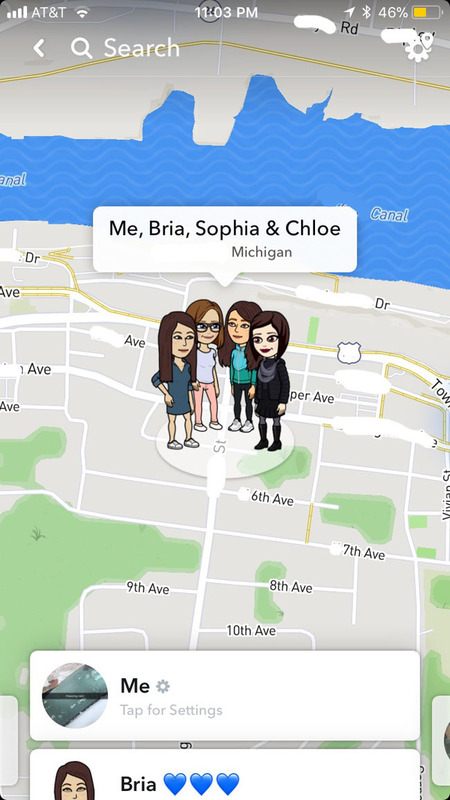 Below you can see me and my three daughters hanging out at home on the SnapMap. You can tell that I have a current story posted and Bria does not. If you were to scroll down through the names further, you would be able to see if Chloe or Sophia had a story or not, and when they last viewed SnapChat. There are a couple of concerns with the SnapMap. First is obviously that people can see your child's location. This is easily fixed by going to settings menu on the upper right hand side of the SnapMap and choosing exactly which people can see your location. You can choose not to share your location at all, you can share it with all your friends, or you can select only certain friends to see your location. 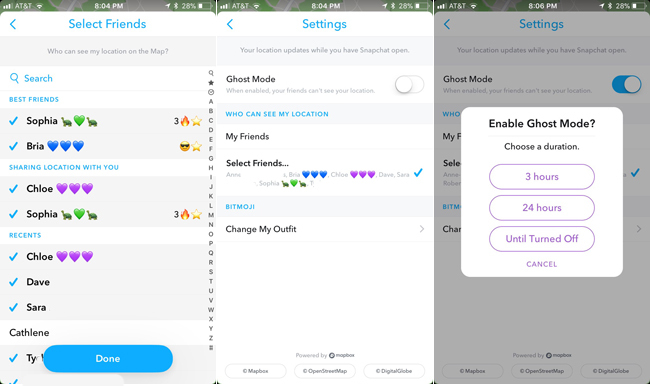 You can also choose to stop sharing your location temporarily by going into Ghost Mode. Below you can see what this all looks like. The second concern that comes up with the SnapMap is that you can also see when several of your friends are together somewhere—and you weren't invited. This has come up a few times with my youngest daughter who has a very large group of friends and she often sees a few of them get together without her and it sometimes results in hurt feelings. But she's also been on the other side of the coin and been at a gathering of friends where others aren't invited. It is a good opportunity to discuss with your kids how they won't always be included in everything and why it's important for them to be as inclusive as possible when they are planning their own get togethers. The SnapMap can be a good thing for parents, because you can see where your kid is. Since it only shows the last location they opened Snapchat, though, it's probably better to make sure your kids' phones are also sharing their location with you in other ways. As with any social media, you must add friends on Snapchat in order to begin snapping and chatting with them. To do this, you click on the "add friends" icon in your profile. Snapchat will find friend options for you via the contact information on your phone to begin with. Once you have added a few friends, it may also start suggesting people based on friends in common. You can also add people if you know their Snapchat user name, or by using their Snap Code, which is the yellow square with their Bitmoji in it. I have never actually seen my kids add anyone that way, so I'm not quite sure how that works! Once you've been on Snapchat for a while, Snapchat will assign you some "best friends." Right now, I only have two best friends, and sometimes I have three—and I gave birth to all of them. Chloe isn't my best friend right now because she barely remembers she has a phone, much less Snapchat (I guess I am thankful for that, although she can be hard for me to get a hold of!). My other two kids send snaps to me regularly enough that they stay my best friends. Sophia has 8 best friends on Snapchat. I like being able to see who she is talking to the most. Her top 4 best friends change positions here and there, but are mostly pretty stable (and I am one of them! ), and her bottom 4 best friends are often changing and falling off the list and being replaced by another friend just because she sent them more snaps that day. You can have up to 8 best friends on Snapchat. Like I mentioned, Sophia has 8, but Bria and Chloe each have 6, and I've got my 2 or 3. I'm guessing it has to do with how much you use the app and how many friends you have added in total. Nobody else can see who your best friends are, but sometimes you can get an idea of who someone's best friends are via the Snapchat Emojis (see below). You can see any friend's profile by clicking on their bitmoji on the main page. This will bring up their name, user name, snap score, any friend emojis, and where they are on the SnapMap. If you want to change any settings regarding that friend, you need to go to the chat screen of that particular friend and click on the hamburger menu on the top left. This will bring up the same things as their profile, plus options to share their username with someone, edit their name (my girls have crazy nicknames for many of their friends), put them on do not disturb, block them, or remove them as a friend. Snapchat puts emojis next to some of your friends based on how you interact with them on the app. 💛 Gold Heart—You are each other's top best friend. This means you send the most snaps to them, and they send the most snaps to you. ❤️ Red Heart—You have been each other's top best friend for 2 weeks or more. 💕 Pink Hearts—You have been each other's top best friend for 2 months or more. 😊 Smiley Face—They are one of your best friends. 😏 Smirky Face—You are one of their best friends, but they are not one of your best friends. 😬 Grimace Face—You share the same top best friend. 😎 Cool Face—You share at least one best friend. 🔥 Fire—You have a SnapStreak. The number of days your streak has lasted will also appear next to the fire. ⌛️Hourglass—Your streak is about to die. If you see this, send a snap (not a chat) in order to keep it alive. You are able to customize the emojis, too. Just go to settings > additional services > manage > friend emojis. From there, you can see each emoji and what it means, just click on the arrow next to the emoji you'd like to change and it will let you choose a new emoji. If your child has customized their emojis, you can see what they mean on that page as well. I changed my best friends to be a star and Sophia has hers set to be a turtle. As a parent, these little emojis can tell me a lot when I look at my kids' accounts. For instance, Sophia has had gold hearts with three different friends, and they turned into red hearts a few times with two of them. But they never have lasted quite long enough to earn pink hearts, so she will usually end up with the gold heart again with someone after losing it for a while. Currently, she does not have a heart with anyone, because the friend she snaps the most doesn't snap her the most. I've never seen a heart on my other girls' accounts, but they say they've had them occasionally. Sophia's current top best friend is a new-ish user to Snapchat. She is definitely one of her in real life besties, so it's no surprise that she catapulted up to top best on Sophia's list. However, Sophia's account now has about 12 friends with the grimace face emoji—meaning this girl is EVERYONE'S top best friend! No big deal, but interesting to note from a parental perspective. You saw on the friend emojis list that there is one for a SnapStreak. When you and a friend have sent each other snaps (not chats) at least once every 24 hours for at least 3 days, you will have established a streak. You can see below that I have a 7-day streak with Sophia (you can also see that Sophia and Bria are my best friends, and that Bria and I actually share a best friend—which is probably Sophia). Among the middle school set, streaks seem to be a really big deal. 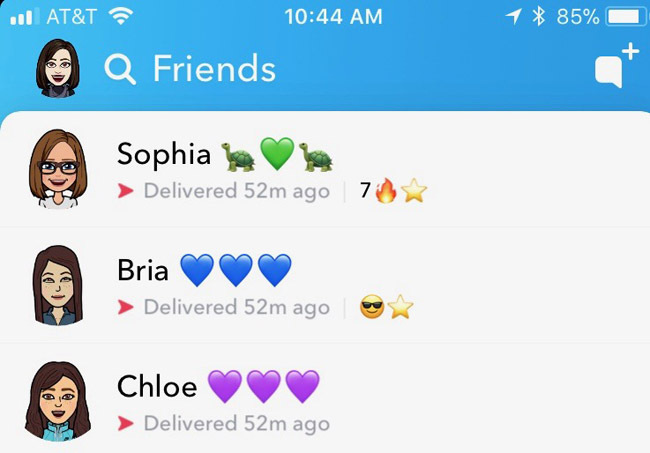 Sophia and her friends send good night streaks every night to each other—a snap that usually says streaks right on it sent to everyone simultaneously. Snapchat is aware of this trend and even has lots of gifs and stickers to decorate your streak snaps with. Sophia just lost a streak that was 150 days old and was maybe a little too upset about it. I think now her longest streak is 77 days or something—like I said, in her friend group, streaks are a huge thing. My older girls just get streaks by snapping more organically, and they usually don't have very many. Either it's not as cool in high school or my particular high school girls just don't care much. Bria jokes that the only emoji she ever sees in her account is the timer, and that's just fine with me! Every Snapchat user has a Snap Score, which is just a way of seeing how much they use the app. Some people say it builds up credibility, but as a parent I think it just helps me see how much time my kid and their friends might be wasting! Actually, I really don't mind Snapchat when communication is happening, but I admit to being a little annoyed when the mindless exchanging of selfies back and forth is going on. The Snap Score denotes how many snaps you have sent and how many snaps you have received. Chats do not figure into the score. On your own profile, you can click the number and see the number you have sent on the left and the number you have received on the right. Mine are about even, though I have received more than I've sent. Also, my score is "pathetically" low—just above 1,000. You cannot see that breakdown on others' profiles, but you can probably assume the numbers are fairly even. Bitmoji and Friendmoji are one of my personal favorite things about Snapchat. I've already been using Bitmoji for a few years and find it super fun. Snapchat teamed up with them and, as you've seen above, the Bitmoji are used a number of ways on Snapchat. Your Bitmoji is your avatar, which can pop up when you are in conversations and will show up on the SnapMap. Sometimes on the SnapMap you'll see Bitmoji doing fun things. I recently saw mine doing yoga (maybe it was trying to tell me something?) and once I saw Sophia's doing a cartwheel. They are usually seen sleeping in the middle of the night, flying in airplanes if you were at the airport, or carrying shopping bags if you're at the mall. Sophia has some friends who live right on the water, and sometimes they are shown in boats near their house. But the most fun part of Bitmoji is all the cute sayings you can send back and forth in chat. And Snapchat has Friendmoji, so you can feature both you and the friend you are talking to in whatever you send, and I see my kids having a great time with that. And I have a great time with that, too! To use Bitmoji (and other regular emojis) in chat, just type what you want to say and then click on the smiley face on the upper right of your keyboard. Any Bitmoji or other emoji and stickers will show up for you to use. Just click on the one you like and it will pop into your chat! You can use them in snaps by clicking on the sticker icon along the right hand side (looks like a paper with the corner folded up). Your most used stickers and emoji will pop up, but you can choose only Bitmoji by clicking on the face with the open mouth on the bottom of the screen. From there you can narrow it down further by searching or by clicking an icon on the bottom (hi, lovey-dovey, happy, mad, celebrations). Sometimes there are also animated Bitmoji lenses you can use in snaps, too. Group chats are just like normal chats except they include more than two people. Conversations can be saved in the same way and chats and snaps can be sent to everyone in the group. The bitmoji avatars will pop in so you can see who is there reading along while you are on. These groups are used for organizing activities or just chatting. Each of my kids have several on their menus. Some of them are pretty dormant, and some are quite active—snaps and chats are flying during the evening when everyone is on. I have found that the most drama happens in these group chats. I have actually required that my daughter leave some of the groups she has been a part of because of bullying, foul language, or other things. 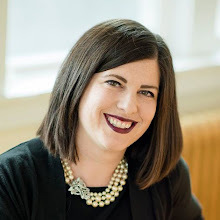 Because we have set a precedent for talking about the things that happen on social media, she is generally pretty good about telling me when things are getting out of hand, for this I am thankful. You can leave a group chat by clicking on the hamburger menu in the top left of the chat screen. You will see several options there, and one is to leave the group. I think the one thing everyone knows about Snapchat is the lenses. We've all seen the rainbow puking unicorns and the puppy dog faces. They are all super fun, and it amazes me that there are new ones almost every day! They almost always have new fun ones for holidays, and sometimes even for movie premiers or new products that are coming out. A Snapchat lens puts something onto your face and/or alters your voice. They have to be put on before you take the photo or video, and kids love to play with them. Sometimes they do fun things if you raise your eyebrows or open your mouth, sometimes they make you dance, sometimes you can use them with a friend, sometimes you can swap faces. Lots of fun things. To access lenses, go to the snap screen and hold your finger down for a few seconds. All of the lenses will then pop up and you can swipe through them and see what they do! Filters are used after you take a photo or video. Once you have taken it, just swipe through the screen and various filters will pop up. Some say the time and temperature, some say your location, some alter the speed of your video, some change the lighting effect. Many businesses and towns offer their own custom filters that will show up when you are using Snapchat from their location. Just swipe through and see what's there! When you are on the snap screen, you will see an icon that looks like two photos underneath the photo button (the big circle in the middle). This is how you access memories. Even though snaps disappear, you can save your own snaps before you send them. You cannot, however, save snaps you receive from others. Still, accessing the Snapchat Memories can help you get some idea of what your kids have been up to and what they've been sending back and forth. You can also save stories to memories. When you take a snap or post a story, there is a download icon available at the bottom left of the screen. It will save this to memories as well as the camera roll on your phone. You can always screen shot anything on Snapchat. This is a good thing. Because the ability is there, kids are less likely to send something that they shouldn't. If someone does take a screenshot, though, Snapchat will notify the other party. This perhaps deters people from taking screenshots because they don't want others to know that they did. So, if you sent me a picture and I take a screenshot of it, you will get a notification that tells you I just took a screenshot of your snap. It will also notify you if someone took a screenshot of the chat screen. My daughter Bria takes a screenshot of any snap I send her if it features our dog, so I get a lot of these notifications from her! It does not send a notification if someone takes a screenshot of your story, but if you swipe up on your story, you can see if any screenshots were taken and who took them. When you are in the chat screen, you will see a telephone icon and a video camera icon. By pushing these once, you can actually call or video call the other person. The fun thing about video calls on Snapchat is that the lenses are available to use, so you can look like a puppy dog or have a mustache or something while talking to your friends. If you press and hold either of those buttons, it will create an audio recording or a video that you can send to your friend via chat. In 2019, Snapchat added the ability to do group video chats on the app. This is my least favorite part of Snapchat as a parent. In the Discover section, you will see articles and news stories from several different sources. You can subscribe to some of these sources, which include celebrity Snapchat feeds, but many of them are just there. And they don't always show the most appropriate material for kids, teens, or anyone really. You can unsubscribe from or choose "see less like this" when you see something you don't like in Discover. Just hold your finger down on the article you don't like and choose the option. It used to be that in order to look at your friends' stories, you would also have to wade through the gunk of the Discover section. This is why I love the 2018 Snapchat update as a parent. Now that you can see your friends' stories on the chat page, my kids hardly ever venture over to Discover. Sure, they still do, and I have gone through it and unsubscribed from many of the sources I don't want them to see, but there is still the possibility that they will come across something inappropriate. 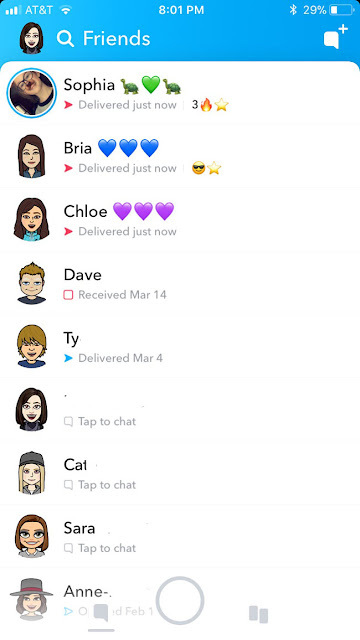 Note: In 2019 Snapchat updated again so that friend's stories are now shown again amongst the discover section AND on the chat page. Just looking at my feed right now, I see Kortney Kardashian in a skimpy bikini and an article about condoms. But I also see some educational articles from National Geographic and a Tasty video about how to make a rainbow cake. Help your kids by looking at the Discover section with them and subscribing to sources you are okay with them looking at, and unsubscribing/seeing less like this-ing to those you aren't. It's a good time to have a discussion about how the media affects us while you're at it. I'm sure there are things I'm missing. Snapchat is quite the beast for parents! But I promise if you sit down with it for a little while and try everything out, you'll get the hang of it. And you'll know how to talk with your kids about it better, too. Try having a Snapchat discussion soon—I think you'll be pleasantly surprised with what your kids tell you about it! I actually have a lot of fun sending snaps back and forth with my girls. It's been a great way for us to connect on their level.